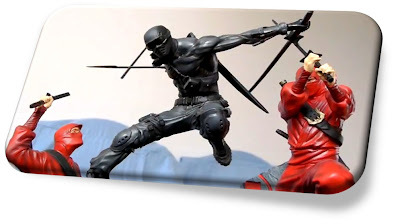 MarketSaw - 3D Movies, Gaming and Technology: MarketSaw's Review Of "Snake Eyes Vs. Red Ninjas" Diorama From Sideshow Collectibles! MarketSaw's Review Of "Snake Eyes Vs. Red Ninjas" Diorama From Sideshow Collectibles! Personally I think this is the finest diorama Sideshow Collectibles has to offer! I received the Snake Eyes VS Red Ninjas Diorama a couple of months ago and filmed the unboxing as I always do and I just finished piecing together and editing the material. All those smiles came back to me as I watch the unboxing again! For me the best part of the G.I. JOE: RISE OF THE COBRA movie was Snake Eyes. His character had the most appeal to me and his fighting prowess is amazing. We need a lot more of where that came from in the sequel. Which brings me to why I have a Sideshow Collectible piece from a 2D movie! Well you may have heard that the sequel, G.I. JOE: COBRA STRIKES is in development and the director is none other than Jon Chu who simply loves shooting in S3D. So I would wager that the studio would be on board with that decision too so we'll see. I hope so! And the diorama is simply gorgeous! And HUGE. The circumference of the base covers a size similar to a large pizza! The fit and finish is intricately done and you can see the care that is placed into these pieces. Love that the Snake Eyes heads and the fighters arms are held in place by magnets for easy swapping out. The production run is limited to 450 and the one I received is #440. Current inventory at Sideshow suggests that they only have about a dozen left - so if you want one - act right away. The piece is made of polystone and is the Sideshow Exclusive (extra Snake Eyes head). I used my Panasonic Lumix GH1 (with the hacked "C" settings) for the review as well as a new tripod (which I used for the last two sequences). I am finally uploading in full 1080p! Be sure to go for the HD version of the clip. Obviously (to me anyway) the biggest impact of this piece is the "floating" nature of Snake Eyes! His foot is anchored into the torso of one of the red ninjas in such a fashion as to create the illusion of a "freeze frame" of Snakes Eyes in mid air during battle. It has to be seen in person to get the full effect. Hopefully the video helps bring that home for you. It is a truly remarkable piece of art. So here's the full review in full HD (specs and pricing follows) - ENJOY! One of the greatest assets to the G.I. Joe team, Snake Eyes' record of honor and valor cause even the most evil enemies to tremble with fear. He trained in ninjitsu under the tutelage of the Hard Master, leader of the Arashikage Clan, who transformed Snake Eyes from a dutiful soldier into a fierce and cunning warrior. The Arashikage Clan had a powerful reputation in Japan and throughout the globe, but after the death of the Hard Master, the clan dissolved in confusion. Many factions arose in opposition, some growing suspicious of the mysterious outsider known as Snake Eyes. The Red Ninja Clan blamed the Hard Master's death on Snake Eyes, and they became frequent and formidable opponents for the G.I. Joe team. None of them were prepared for the superior training and natural skill of Snake Eyes. His every victory compels the Red Ninjas to try even harder to defeat him in hand-to-hand and melee combat, but they have yet to succeed, each encounter escalating into a fierce clash of swords and fists. Snake Eyes meets each challenge with the same honor and valor that have made him such a valuable asset to the G.I. Joe team. This detailed sculpture captures the ongoing battle between the silent Joe and the Red Ninja clan. Each piece is individually painted and hand finished, each with its own unique quality and detail that is the trademark of a handcrafted Sideshow Collectibles product. The lower sand base is removable to allow a more compact customizable display. The stunning Snake Eyes VS Red Ninjas Diorama is an outstanding addition to any display, a perfect centerpiece to any G.I. Joe collection. Pricing: $299.99 or $100 / month for 3 months on FLEXPay. You can view all of the diorama details right here. I completely endorse this diorama for anyone considering it. I especially recommend this piece for owners of home theaters or display cases! Many, many conversations will be started by this item as we await the sequel to the first G.I. Joe movie. I am looking forward to the next review - keep checking for more! !